If you work in an office or cubicle as I do, utilize as much of your space as possible by hanging them on your walls, framing them and placing them on your desk, and changing your computer desktop to reflect your goal. If you don’t work outside the home, place visuals on your fridge, in your home office, or use a chalkboard to create a progress tracker. Travel for a living? Change the background of your phone to a photo that epitomizes your goal. Clip a photo or a small note showing your current balance to your visor or stick it beside your speedometer. 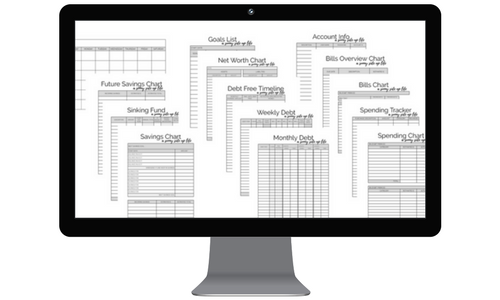 Design your own chart that represents your debt. Pick up some cheap vases or mason jars and a bag of glass beads. Label the vases/jars for each debt you owe, assign a dollar amount per bead, and drop in the appropriate amount of beads for each principal payment. Have kids? Get them involved. Create a paper chain that represents the amount you owe by assigning a specific amount to each link and cut a link from the chain each time you pay that much in principal. You wouldn’t need much more motivation with something like that hanging in your house for all your guests to see. Make them pretty by using large, bold fonts and tack them to your cubicle wall. For an extra aesthetic touch, put them in simple, inexpensive frames. Use a bulletin board, poster board, the wall of your cubicle, however you want to do it. Print photos that represent goals in all areas of your life – financial, health, personal development, work goals, etc. Develop timelines for future goals and post them on your board. Include pictures that represent your “why” to keep yourself focused on the major reason you’re sacrificing and striving for your goal. If you do not spend most of your time in one place, or if you want to maintain laser focus, use a collage maker app to change the background of your phone or laptop to reflect your vision. This suggestion does not follow the norm for visual aids, but creating my blog and social media accounts have kept me accountable and excited about paying off my home more than any other aid. Starting out, I signed up with the free version of WordPress and soon upgraded to an inexpensive plan that allowed me to customize my domain and monetize my site. Shortly after my site went live, I created social media accounts using the pen name from my blog. At this point, my personal Instagram has long since been abandoned, and I only check my personal Facebook every couple of days or so. With a few exceptions, I follow only my heroes and others who are on journeys similar to mine. Doing this has kept me from exposure to the mundane drama that the friends on my personal accounts share everyday and helps me keep my mindset in the right place.